What's better than an exciting opening to a fantastic concert? A fantastic concert with exciting openings! This concert is filled with music set to thrill the audience and keep you on the edge of your seat. South Charlotte is a great area to enjoy the Christmas Season. From the skating rink at the nearby Arboretum to the beautifully decorated homes in the many nearby neighborhoods, it's quite fitting that Providence High School will be home to our Annual Christmas Concert. Spread the Christmas Cheer with the Charlotte Concert Band as we lift your spirits on December 8th. On Saturday, March 9 at 7 PM, Charlotte Concert band will take you around the world as we visit France, Russia, England, and more! Buckle up and enjoy the ride with the Charlotte Concert Band! Now that we're back stateside, let's enjoy a bit of time traveling! We'll go back to the days of the Gold Rush, when the brave went West without any knowledge of what was to come. For the first two concerts on October 6th and December 8th, we will be performing at Providence High School in South Charlotte. For our second two performances on March 5th and May 11th, we will be at Myers Park High school. 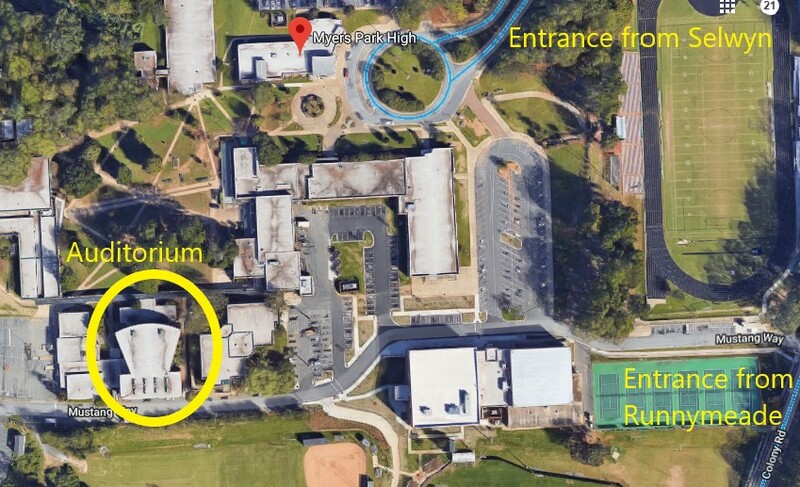 Click Here for a map to Myers Park High School. Tickets to all concerts are $10 each, or $5 for students. CLICK HERE for tickets to Around the World in 80 Minutes!